Hardcover, 9.5 x 11.75 in. / 304 pgs / 380 color. Edited by Felix Krämer. Text by Javier Arnaldo, Max Hollein, Sandra Oppmann, et al. Ernst Ludwig Kirchner painted city life as a joyous, bustling pageant, a sophisticated swirl of desiring bodies and colorful urbanity, giving Germany an energetic iconography for the glory days of modernity. One of the four founders of Die Brücke (The Bridge), Kirchner drew on German Renaissance art to conjure expressive exaggerations of face and posture, and brought to landscape painting a city-dweller's zest, imbuing tranquil scenery with riotous energy. Coinciding with a Kirchner retrospective at the Städel Museum--the first to be seen in Germany in 30 years--this massive volume surveys the artist's several creative phases and genres. It features the famous nudes made during the Die Brücke era, his classic scenes of frenetic Berlin city life and Swiss mountainscapes from Davos, along with lesser-known canvases, works on paper and sculpture. 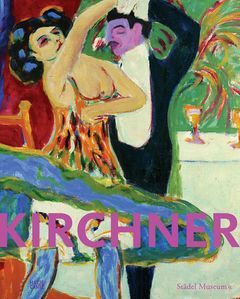 With essays by renowned art historians, this definitive monograph offers fresh perspective on the continued relevance of Kirchner. Born in Bavaria, Ernst Ludwig Kirchner (1880-1938) studied architecture in Dresden, where he met the young painter Fritz Beyl. With Beyl, Karl Schmidt-Rottluff and Erich Heckel, Kirchner founded the group known as Die Brücke. Casting aside the then-prevalent academic style of painting, Kirchner and his friends allied themselves with early Renaissance artists such as Albrecht Dürer, Matthias Grünewald and Cranach the Elder, and revived older media such as woodcut printing. 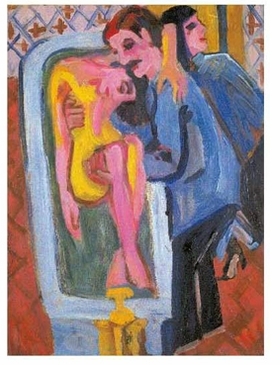 Kirchner briefly saw army service in the First World War, but suffered a nervous breakdown and was discharged. 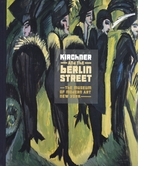 In the interbellum years Kirchner's reputation grew enormously, until the Nazi regime branded his art degenerate: in 1937 over 600 of his works were sold or destroyed. In 1938, despairing of this destruction and the general political climate, Kirchner committed suicide. Featured image is from Kirchner, published by Hatje Cantz. "As a child, Ernst Ludwig Kirchner lived in Frankfurt am Main for a short time before his family moved to Switzerland in early 1887. In 1916, he still remembered 'the large railway station, which was under construction at the time, the animals and people on the streets and at the zoo. Also my first impressions of art in the Frankfurt museum, the paintings of the Grunewald School. Old sculptures and the foreign peoples…' Kirchner was undoubtedly suggesting here that central aspects of his artistic conception had thus already been formed." Excerpt from Thomas Roske's essay in Kirchner, published by Hatje Cantz. FORMAT: Hbk, 9.5 x 11.75 in. / 304 pgs / 380 color.